This is a wide angle shot from one of our recent weddings at Epping Forest Yacht Club in Jacksonville, on the river. Entertainment is a crucial part of the wedding planning logistics and this is where a wedding DJ comes in handy. The DJ that you select to entertain your guests can make or break the night. In your location, there are many professional DJs to choose from but before you get started, there are some crucial points to remember. These guys can make or break your wedding entertainment and it is thus advisable to put a lot of thought into your choice. Why Hire a Professional Wedding DJ Anyway? If you really want your guests to stay entertained, hiring a professional DJ from your local area is the best decision. It can make or break your party. Leveraging their technical experience: They understand their trade and will ensure the equipment is set up properly and the sound is great. Peace of mind: This is your big day and you need to relax and enjoy yourself. With a professional DJ in charge of the music, you have nothing to worry about. Interactive entertainment: A professional DJ ensures the guests stays informed and hyped up. They teach people how to dance and get on the dance floor to help keep the energy going. Customized music: These experts will accommodate your playlist and ensure all songs you select are played. Visual entertainment: The best DJs arrange a good set which includes visual entertainment such as lighting, fog machines, LEDs and much more to give life to the ceremony. Continuous entertainment: There will be no pause to the music as a DJ unlike a band needs no break. 1.Experience and track record in the industry: Pick an experienced professional by seeking referrals and recommendations from other couples or your wedding planner. Make sure you listen to several of their wedding mix sets. If they have youtube videos, that would be helpful. Photographers and Wedding planners are great sources of referrals. 2.Specialization: Look for a DJ who specializes in weddings as they are easier to work with. They can handle the pressure and unique requirements during the big day. The best wedding DJ should have the prerequisite equipment and backup. 3.Music customization: Only use a DJ who is ready to play your chosen playlist without alterations. 4.Crowd Interaction: Confirm how your DJ handles the crowd and requests; how they read a crowd’s mood and techniques they use to hype the crowd. Do they get out their and dance too? Do they play games? Do they have props? 5.Range of services: Some Djs offer additional services including lighting, fog machines, and HD video screens among others. These are just a few of the considerations when choosing your wedding DJ in the Jacksonville area. 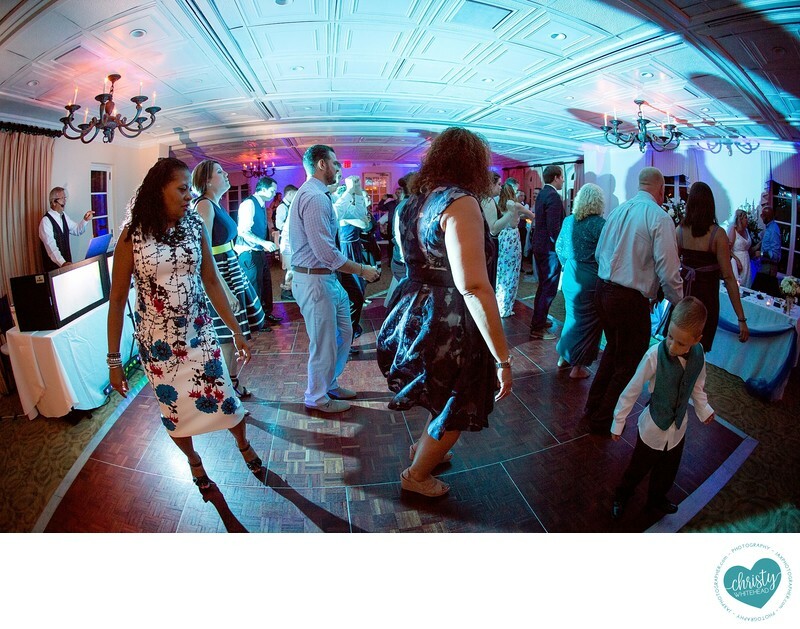 With your guests on the dance floor, Christy Whitehead Photography will capture all your guests having a great time. Ask us for our recommendations. We've worked with some great ones and some HORRIBLE ones! Location: Epping Forest Yacht Club.